Car crashes happen every day, in every state, all over the country. There are many reasons they happen, but some of the most common reasons are the most preventable. 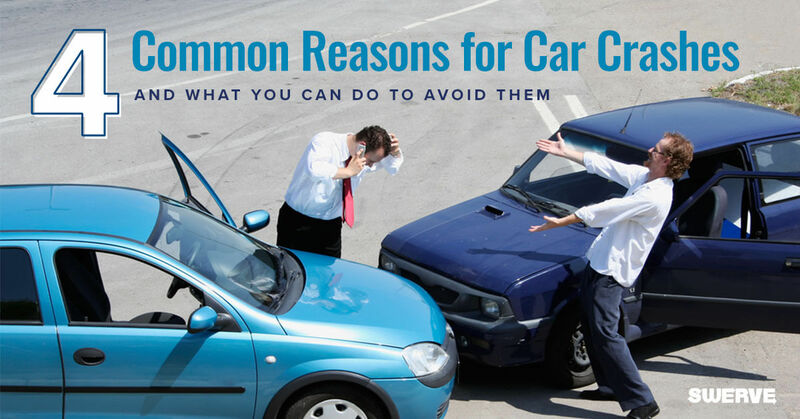 Here are four of the most common reasons for a car crash and how you can avoid them. Not paying attention to the road for even a few seconds can lead to a collision. Depending on the speed, a car can travel up to several hundred feet in just seconds and each of these takes the driver’s attention away from the road. Put your phones and devices away, don’t get so involved with anything that takes your attention away from the road, and pull off the road if you need to accomplish any of the listed tasks. Being impaired means being weakened or damaged in, or having some sort of disability. When applied to driving, this comes in a few different forms, including driving while drunk or under the influence of drugs and medication that decrease your ability to function in a normal way. Driving when you are overly tired is another form of impairment. If you are driving under any of these circumstances, you are not capable of driving a car responsibly. Your thinking and reasoning skills are slower, vision is compromised, and reaction times are much worse. Car crashes are often a result of driving impaired and come with heavy consequences, including jail time and a revoked driver’s license. Never get behind the wheel of a car if you’ve been drinking or doing drugs. Check all medication warnings carefully and pay attention to how you feel before attempting to drive. If you know that you will be in a situation where your driving abilities will be impaired, arrange for someone else to drive. If you are feeling too tired, pull off the road and take a nap or switch drivers. Never take a chance or reason that you’re good enough to drive. Too often, people are driving while in a hurry, going too fast. All it takes is getting cut off, hitting black ice, or trying to run a red light to cause a collision. Police can determine how fast a vehicle was going in a crash based on the tire’s skid marks on the road and the severity of the damage to another vehicle. It is harder to stop a car that is going fast, but it also has more force behind it when the crash happens. Pay careful attention to how fast you are driving. Do your best to not feel rushed while driving by giving yourself plenty of time to reach your destination. Don’t race other cars. The last common reason for car crashes is because drivers get too aggressive with another driver on the road. When someone gets cut off or becomes impatient with a slower driver, sometimes they can’t let it go and get aggressive by trying to get some sort of payback. These aggressive movements put everyone around them at risk and often result in dangerous situations, including a car crash. Keep your cool when driving. Don’t overreact when someone does a stupid move in traffic. Instead, try to be patient and assume it was unintentional. If someone is getting aggressive with you, call the police. Don’t try and handle it yourself or add more aggressive behavior.